Silent, compact, and extremely efficient. The models of the BOGE C series are real trend setters. The belt driven models of the BOGE C series up to 22 kW provide absolute efficiency and are virtually silent, requiring an extremely limited amount of space – even with integrated the dryer. The integrated design stands for small compact design and extremely low pressure losses. 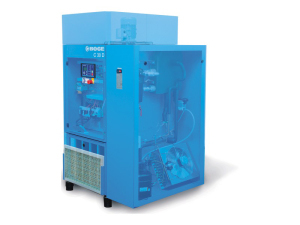 Aside from its remarkably low energy consumption the compact module of the BOGE C series is able to reliably generate a large Free Air Delivery.